Kathi Macias and I met at a writers conference last year. She's become a good friend and mentor. When I asked her to guest post for my 4th Blogoversary, she not only agreed but offered to do a giveaway. The details are at the bottom of this post. Here's Kathi! It is said that writing is 10 percent inspiration and 90 percent perspiration. I absolutely agree, and I’m sure most successful writers would echo my sentiments. Inspiration is the easy part. Over the years I have spoken with and taught beginning writers from all around the world, in all sorts of settings. I have helped them review, edit, and rewrite their work, and I have found one common thread among those would-be writers who eventually become published authors: They are willing to devote themselves to the not-so-easy part of writing—the 90 percent perspiration. 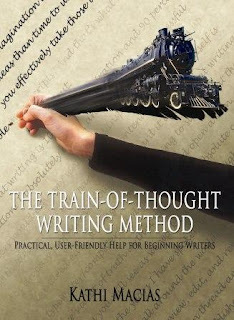 As I worked with these many writers I discovered what I consider to be the simplest and most practical writing method available: the train-of-thought method. This excellent, well known writing method did not originate with me (though I’ve tweaked it a bit), but it seems no one had ever taken the time to put the method into book form. I therefore decided to do so myself, personalizing each chapter with my own experience. This is not a book about proper grammar or punctuation, or how best to choose the voice or set the scene for your great American novel. There are already countless books covering those subjects, if that’s what you’re seeking. But if you want to know how best to take your thoughts and dreams and put them into a clear, compelling, readable manuscript, then this is the book for you. Having personally seen the train-of-thought writing method help so many new writers learn to organize, write, and polish their ideas into successful manuscripts, I offer this book to those who would do the same. May it direct and encourage you as you enter into the 90 percent perspiration phase of your writing career—the serious phase through which true writers are formed. 1. The contest is open to Followers of Christian Writer/Reader Connection. 2. Only U.S. residents are eligible to enter the drawing. 3. One entry per person by commenting on this post. 4. Deadline: Saturday, May 12, 2012 at midnight. The winner will be announced on Sunday, May 13, 2012. If the winner doesn't contact me by Saturday, May 19, 2012, another person will be drawn from the entries. Instructions will be given on the blog on how to contact me. 5. Once I have the winner's name and snail mail address, I'll forward them to Kathi Macias, who will send out the book. Question for writers: How do you organize your thoughts when writing a manuscript? Question for readers: When you write something for school, a letter, or some other correspondence, do you put them in some kind of order prior to the actual writing? How? I have always wanted to get my book published - but the thing I can't do is give it 90% right now - because of other issues going on. Maybe someday. I'd love to be entered in the giveaway. Thanks so much! Sounds interesting! Thanks for sharing, Kathi and Susan. Hi Chatty - You might want to do some preparation. This book would help you take advantage of that "someday." Hi Karen - Thanks for entering! Hi Sarah - I've heard her speak about this method. Even as a SOTP writer, I can put some of this into practice. Thank you for having Kathi as a guest on your blog. Please enter me in your drawing for her book. Hi Kathi P. - Thank you! Kathi's a good friend and teacher. Hi Cecelia - Thanks for entering the drawing. Thank you for this post and the chance to win Kathi's book. I'd love to enter this drawing. As an author, I make notes the moment I get an idea. If I don't write it down, it's gone. I followed this blog and I'd love to read Kathi's book. Thanks! Hi Janette - I heard Kathi teach on this subject, and plan to get the book. Hi Stephanie - Thanks for becoming a Follower here at Christian Writer/Reader Connection. I'm the same way. Ideas have wings and fly away.